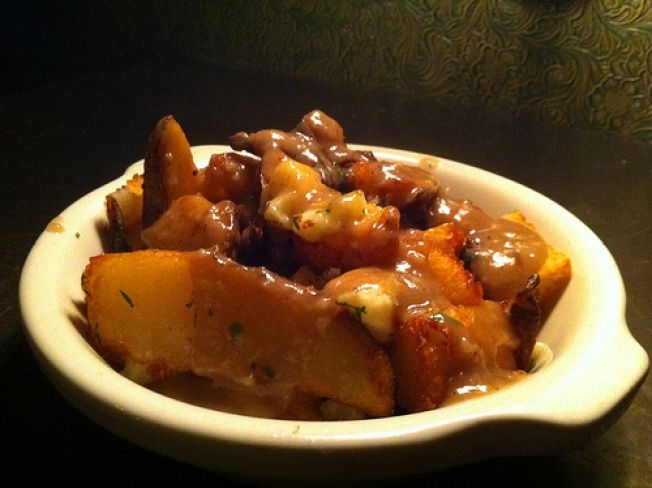 Fried potatoes, cheese curds and gravy. Ever since it opened last year, Comstock Saloon in North Beach has become one of my favorite after-work hangouts. As its name implies, the vibe is saloon-like, down to the live piano on the mezzanine and the old-school cocktails (think Manhattans and Sazeracs). And to be honest, I rarely visit a bar with the quality of food in mind, but Comstock’s dishes are just as good as their drinks. During one of my last visits, I ordered a hop toad cocktail, made of Jamaican rum, apricot brandy, lime and bitters. Strong and oh-so-slightly sweet and tart, it was a good accompaniment to the plate of fried potatoes I shared with a friend. Served with cheese curds and gravy, I imagine these amazing potatoes are a tribute to poutine, the classic Quebecois dish that I wish would take hold in California already. That’s what makes Comstock so great. They have terrific all-day fare, with an emphasis on hearty, traditional cuisine. Naturally, a place with solid drinks and food, and in a convenient neighborhood to boot, gets busy, even on weeknights. If you’re coming with a large group, it’s best to make reservations ahead of time. But even with a crowd, the service at Comstock is consistently friendly yet professional. They may have been open for less than a year, but Comstock seems to have it all. Mariam Hosseini is a Bay Area native who has been writing about food and travel for seven years. She blogs regularly at yogurtsoda.com.